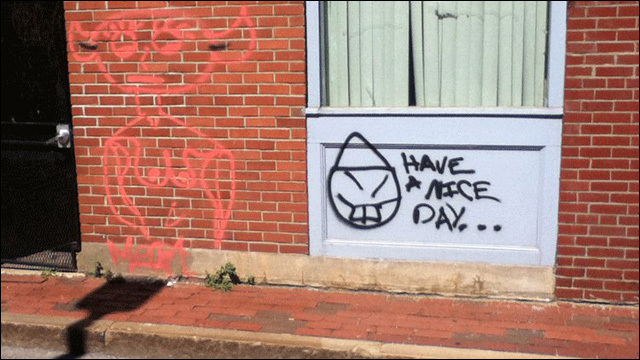 The Boston Chinese Evangelical Church was spray-painted with racist caricatures. Last month in Boston, a Chinese American church was vandalized with several instances of hate graffiti. Church members found racist Asian caricatures spray-painted on their office building in Chinatown. The Boston Chinese Evangelical Church's office building was vandalized with racist graffiti on July 31. 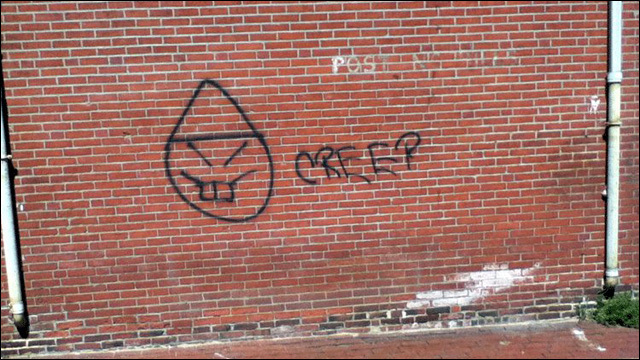 According to Sampan, the graffiti depicted a face with slanted eyes, buckteeth and a cone-shaped hat. The image was drawn twice, along with the words "creep" and "have a nice day." I'm sure someone thought they were being clever. Damn. That face is universally racist. You don't even need to say or write a word. Just draw a picture. This graffiti is reminiscent of the racist note left by those two guys who broke out of a New York prison a few months ago. A pair of convicted murderers managed to dig their way out of a maximum security correction facility, but not before leaving behind a note featuring this very same racist caricature. Sampan includes information for a city hotline to report future instances of graffiti, but it's not clear if there will be any further investigation into this particular incident. Is this not considered a hate crime?